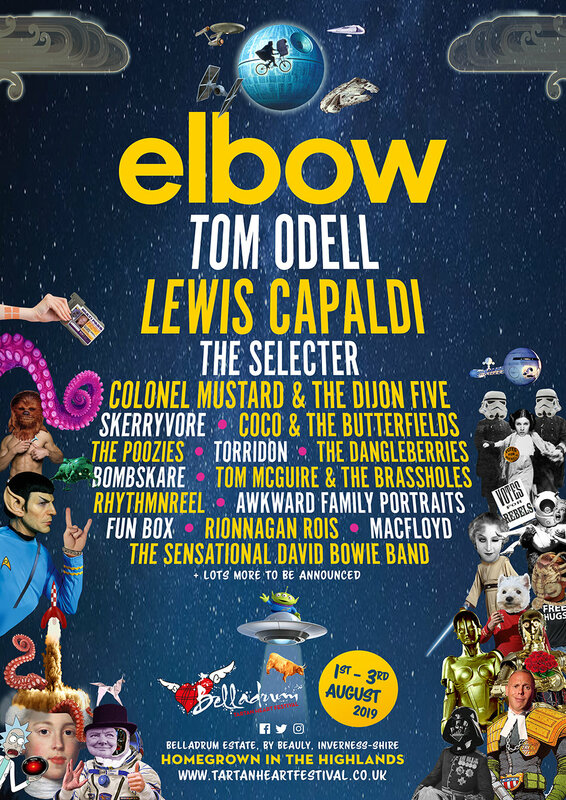 Belladrum Tartan Heart Festival announces today that ELBOW, one of the UK’s most successful bands of recent times, will headline the Thursday night of Bella 2019. Over twenty years and seven studio albums, ELBOW have achieved many of the accolades that mark out a successful band. Their cabinet boasts three Ivor Novellos, a Mercury Music Prize, and a BRIT award for Best British Band. Their most recent albums, ‘The Take Off and Landing of Everything’ (2014) and ‘Little Fictions’ (2017) have both debuted at Number One in the UK album charts. Lead singer Guy Garvey, who also has his own BBC 6 Music radio show, has been rightly commended with two awards in 2018 for his contribution to UK music. The Manchester band have released a series of anthemic singles including, ‘Magnificent (She Says)’, ‘Grounds for Divorce’, and ‘One Day Like This’ which will fill the Garden Stage on our opening night. In further line-up announcements TOM ODELL will make his Belladrum debut. Having burst onto the scene in 2013 with his debut album ‘Long Way Down’ and winning the Brits Critics Choice award the same year, Tom has firmly established himself as one the standout solo artists of recent times. The unstoppable Scottish artist LEWIS CAPALDI will also be joining the Garden Stage line-up. Over the last 12 months Lewis has released a string of incredible heart-breaking and beautiful singles including, ‘Lost on You’, ‘Grace’, ‘Someone You Loved’ and his debut ‘Bruises’ which has racked up in excess of 87 million plays on Spotify to date. Coventry’s original 2-Tone Ska band THE SELECTER fronted by the iconic Pauline Black are set to join us and back by popular demand bringing their very unique themes of Peace, Love and Mustard are the one and only COLONEL MUSTARD & THE DIJON FIVE. Other acts appearing over the weekend include, celtic folk rock act SKERRYVORE, indie folk pop act COCO & THE BUTTERFIELDS, trad-folk band THE POOZIES and the Highlands own TORRIDON. THE DANGLEBERRIES will make a very welcome return, also everyone’s favourite Scottish Ska band BOMBSKARE join us as well as TOM MCGUIRE & THE BRASSHOLES who will close the Ice House stage on the Saturday night. RHYTHMNREEL, AWKWARD FAMILY PORTRAITS, FUN BOX and Children’s Gaelic Choir RIONNAGAN ROIS will open the mainstage in the Saturday night. Finally, our late-night sets on the Grassroots stage will feature firm favourites MACFLOYD alongside THE SENSATIONAL DAVID BOWIE BAND. Many more acts will be announced shortly. The festival has also announced its theme for 2019 will be Sci-fi and the family fancy dress competition will return to the festival’s Venus Flytrap Big Top on the Saturday afternoon. Grab your friends and family, get your creative juices flowing, use the force and boldly go where no fancy dress has gone before for your chance to win tickets to the 2020 festival! 2019 tickets for the 16th Belladrum Tartan Heart Festival, voted Trip Advisor’s most popular UK festival in 2017, are on sale on-line and via ticket agents. Buyers can pay in seven monthly instalments if they buy tickets before 1st January 2018. All on-line ticket buyers can take advantage of a 72 hour cooling off period after purchase during which they can return bought tickets. As well as the standard 3 day festival tickets a limited number of Saturday only tickets are available alongside, campervan/ caravan, BellaDub VW Campervan and electric hook-up tickets. Patrons planning a stage or hen party, or just coming with a group of friends, can make a group bookings of 10 or more tickets with no booking fee via the festival web site tickets page as can disabled ticket applications. VW campervan owners can buy tickets to the BellaDub VW Campervan area. Glamping providers Pitch Village have their tents on sale via Bella’s Skiddle tickets page and Yurts & Squrts accommodation is available via the festival’s web site page. Bella’s lead charitable cause for 2019 is Scottish Association for Mental Health (SAMH). Donations will be collected in memory of Frightened Rabbit’s Scott Hutchinson, the band were due to headline the Hot House stage in 2018. Donations can be added to ticket purchases via Skiddle and other opportunities to donate during the festival will be announced in due course. Car parks and camping areas will be open from 0800 and arenas will open from 1300 on the Thursday. Bella sold out in 2018 for the tenth year in a row so fans are urged to buy early to avoid disappointment. Previous headliners and major artists included: Paloma Faith; Tom Jones, Manic Street Preachers, The Pretenders; Franz Ferdinand; Twin Atlantic and First Aid Kit. Belladrum Tartan Heart Festival takes place in the beautiful Highland surroundings of Belladrum Estate, near Beauly in Inverness-shire. The independent festival has built a reputation for its eclectic line-ups, its offbeat non-musical entertainments and its all-ages approach. The festival won a VisitScotland Thistle Award in 2009 and is a past winner of the Grassroots Festival Award at the UK Festival Awards, the festival industry’s ‘Oscars’.